In a review and discussion of several hundred articles and dozens of doctoral dissertations written from the 1960s to the 1990s on the transmission of traumatic effects of the Holocaust to the second generation of survivors in North American families, Irit Felsen writes that the study of these descendants does not provide evidence of psychopathology—members of the second generation do not develop psychological disorders because their parents underwent psychic trauma, in other words—but suggests rather that we should discuss the transmission of trauma in terms of personality development. Individual psychic development is determined by both self-definition and one’s relatedness to others, and in normal development these two processes facilitate each other in the production of healthy individuals. In the context of development within an environment in which one must relate to parents, not to mention other family and community members, who suffered massive psychic trauma, development will reflect this context, and this is especially so within cultures that stress relatedness and interdependency within family and community. Worldview is inherited largely from family and wider community, and when both have been exposed to trauma, the second generation will also be affected. Members of this generation find themselves repeating and reenacting aspects of their parents’ trauma. They become obsessed with the lack of memory and the uncanny repetition of the trauma in their parents’ lives, identifying with these victims while seeing an unbridgeable gap between themselves and their parents. Because their parents have not themselves integrated the trauma into their autobiographical memories, the second generation feels the effect without directly experiencing the trauma that has caused it. As in the cases of their parents, the signifier—the effects of the trauma—are present, while the referent—the trauma itself—remains outside of conscious knowledge. ...Whole communities can be affected by trauma, and Kai Erikson, in his own studies of communities destroyed by disaster and in his survey of research done on other such communities, has found no examples of such trauma creating increased senses of communal bonds or other positive effects. Nor should this be surprising. As Erikson has observed in his study of communities that have undergone trauma, it is the community that provides context for individuals and can cushion pain; when all or most of the individuals of a community suffer massive trauma, the community itself will be profoundly and negatively affected. Disasters that befall entire communities will fracture the social group, observes Erikson, and dominate the way the community sees itself and the imagery it uses. 1. Janzen, D. (2012). 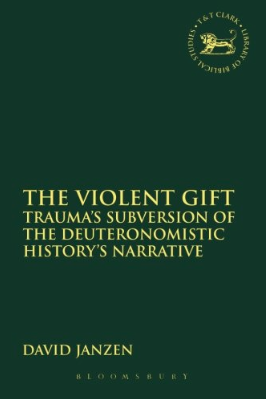 The Violent Gift:Trauma’s Subversion of the Deuteronomistic History’s Narrative (pp. 32–34). New York; London; New Delhi; Sydney: Bloomsbury.